We woke to the wind dancing through our window, the curtains fluttering and twirling. And on this breeze was carried the sweet scents of tropical flowers and the morning song of multitudes of birds. The sky was the bluest blue in this “Land of Eternal Spring” and Jacque was eager to show me the city of Antigua. On her last visit here, I remember her enthusiasm when she emailed me: “Mom, you’re going to love Antigua. The light and color, the architecture, the warmth and kindness of the people, it will all grab hold of you!” I was sweetly pulled from sleep by this lovely morning and by the memory of her words, and I set out in full anticipation (after that delicious breakfast, of course). This was to be our one full day of exploring Antigua. What a difference from our evening excursion yesterday! When we lit out last night, all was dark and glowing. This morning, however, brought a new world, one of vivid brightness and color, just like Jacque described. Storefronts and houses alike were set flush along the street, distinguished only by the differing hues. Volcan de Agua remained hidden underneath its cloudy sombrero. Still, its magnificence was not lost on us. 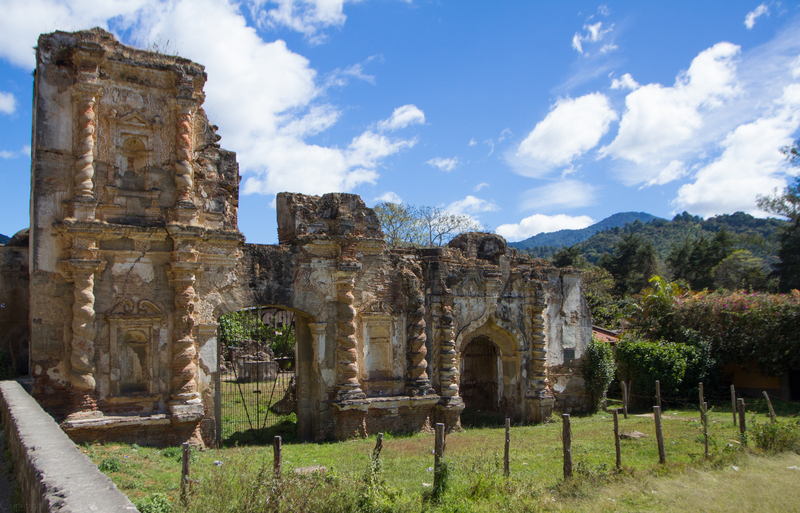 We took a different route this morning, heading instead ten or so blocks north of the town center, and were greeted by yet another burned-out, destroyed-but-kept-anyway-and-thank-God-for-that, church ruins: Las Ruinas de la Candelaria. Ah, the history that just leaps out at you! The swirling columns and colonial architecture reveal a church that even now waxes nostalgic over the remnants of its architectural beauty. It must have been a splendid example of Baroque craftsmanship when first built, in 1548, at the behest of Bishop Francisco Marroquin. Then, earthquakes and fires attacked starting in 1717. Rebuilding occurred at least twice but in 1773, much of it was shaken, and crumbled to its foundations and this is much as we see it today. Is that a fountain in the courtyard? Interestingly, at la Iglesia de la Candelaria, mass was held in indigenous languages rather than Latin. The basketball court adjacent to it gives a feel of a neighborhood church, less for the tourists and more for the locals. I liked that a lot. Try this nifty interactive map to see exactly where these and other ruins and monuments are located in Antigua. Passing the basketball players and the tortilla makers with their hard-to-refuse handmade tortillas and heading toward the town center, we encountered a young weaver and her brother. Neither could have been older than twelve or thirteen yet they were clearly in charge. Although the brother did not want to be photographed, our young weaver agreed when I asked her that if I bought something, might I take her photo? She was happy to oblige. 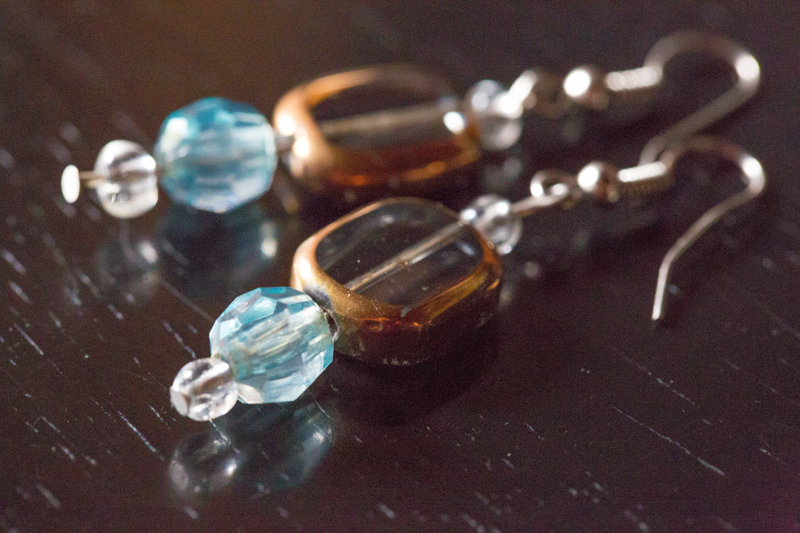 I love this photo of her and I love my earrings – “aretes” – too! This entry was posted in A Mother-Daughter Journey to Guatemala and tagged "Land of Eternal Spring", Antigua, brother and sister, children workers, color, earthquakes, Guatemala, Guatemalan textiles, Las Ruinas de la Candelaria, the ruins of Antigua, weaver. Bookmark the permalink.